A teacher at Ingezi Primary School is being accused of initiating a grade two pupil into 'Satanism'. Her name is Estere Gudoshava, she's 39. She was arrested and charged for the act. The Zimbabwean woman is set to appear in court on March 20. Gudoshava who resides in Jacaranda Avenue, Westview in Kadoma was summoned to court on Wednesday and ordered to return on March 20 for commencement of trial. The charge stated that on March 6 the accused ordered the complainant to go out of the classroom. While outside she allegedly took a razor blade from her handbag and cut the pupil underneath her right leg. 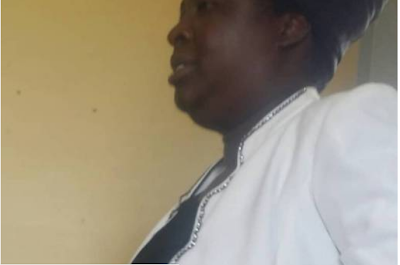 When the issue was disclosed, she was arrested and the complainant was taken to Kadoma General Hospital for medical examinations and a medical report would be produced as an exhibit. In her defence, Gudoshava is denying the charges, instead saying the pupil absconded lessons on the said day and she did not know where she was. The father of the pupil and some relatives reportedly stormed the institution on Monday baying for the blood and sacking of Gudoshava over the issue. Learning temporarily came to a halt as they were demanding instant justice for the teacher.